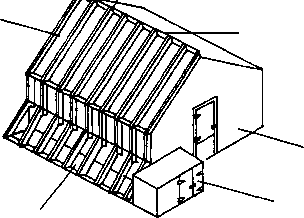 The two designs presented here show the possible transformation of a conventional bin dryer to an indirect solar bin dryer using the original structure of the drying bin. Considerable savings in fuel consumption can be made if this low cost heating portion is added to the bin. This drying bin is aligned longitudinally on an east-west axis, the south facing side on the roof being used as the solar heat collector. This roof collector is sloped about 30° from the horizontal and is designed to produce an optimal temperature rise of 5 to 120c over the outside air. The bin structure provides about one square meter of collector area for each two cubic meters of grain. The author has found that this ratio provides an acceptable drying rate for shelled maize. The roof surface is painted black to absorb the solar energy. A transparent plastic film is supported about 8 cm above the roof by stretching it over the framing meirbers set edgewise. 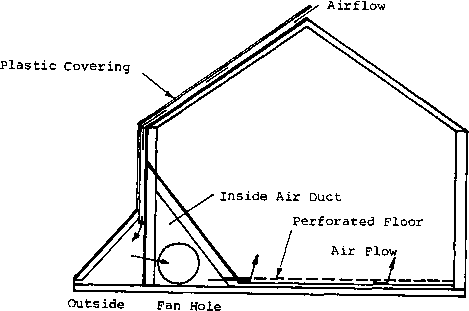 The air, drawn by a fan, enters the opening along the roof peak and moves through the collector roof down the south wall into the outside air duct. 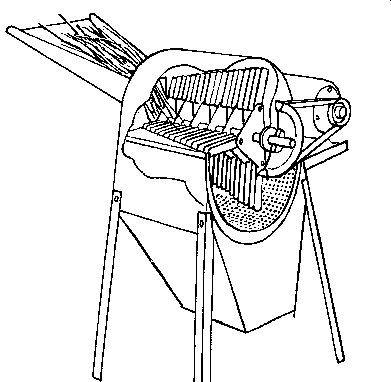 From there, the fan pushes the warmed air into the inside air duct and through the grain by way of a perforated floor. The bin is designed to dry half its depth of shelled maize at one time (1,22 meters). The fan should be able to deliver about 2 cubic meters of air per minute for each cubic meter of corn to be dried assuming the bin is full. Dimensions: The overall dimensions of the dryer are 4,88 meters wide (16 feet), 2,45 meters high (8 feet) at the top of the walls and can be as long as 18,3 meters (60 feet). See figure 1 & 2. Location: Campus of South Dakota University Brookings, South Dakota, U.S.A. The product to be dried was shelled corn at 25% moisture content wet basis. The bin described here can hold 12 cubic meters of grain per meter of length. However, the experiments reported in this case study were made using a scale prototype design and only 1,4 cubic meters of grain were dried. The product was dried in two layers after 44 days to 14% M.C. 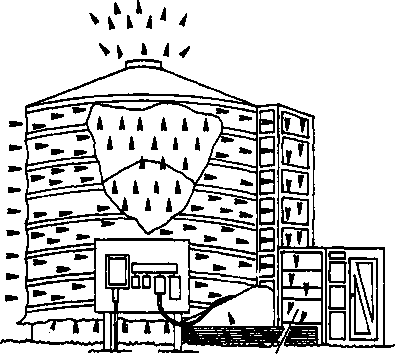 In drying maize, the author advises that the fan run continuously day and night until the top grain is down to 20% moisture or less. This will ensure that the top level does not spoil before the lower layers can be dried. After that, the fan can be shut off during rainy periods, and opened the rest of the time . Operating the fan only when the sun is shining would result in slower drying of the top layers and over drying of the bottom layer. The main expense is the replacement of the plastic sheet if plastic is used. The scale prototype used 46 Kwh of electricity per cubic ...meter of dried corn. Energy costs in the U.S. Midwest are approximately $0.70 per cubic meter of grain. 20 to 30 years for the bin and the fan. One season for polyethylene if it is used. Some Tedlar-coated fiberglass reinforced plastics are guaranteed for 25 years. This plywood bin costs more than a round steel silo.
. Being a new type of larger dryer, it requires demonstration to prove workability.
. With the new low temperature drying technique*, the bin could probably be loaded entirely in one day with 25% moisture content shelled corn. * The low temperature drying process is based on the use of natural air during October and November in the northern climates. Only a small amount of heat (30c air temperature rise) is added to the air to allow control of the humidity, and to lower slowly the moisture content of the grain to a moisture content where it can be safely stored. The process is slow because of the limited capacity of low temperature air to absorb moisture. The key to successful low temperature grain drying is to provide sufficient air to advance the drying front through the grain before any damaging deterioration takes place. If corn was dried during the warmer temperatures of early harvest, it would be necessary to dry it in one week to prevent deterioration. This would require an air flow 6 to 8 times greater than if this corn was dried during the colder temperatures of late fall. South Dakota State University Dept. of Agricultural Engineering Brookings, South Dakota 57006 U.S .A. The air pulled by a 5,6 Kw, 61 cm axial flow fan is routed between the bin wall and clear plastic, on both sides of the aluminum sheet at an air flow velocity of 28,3 cubic meters per minute. This air was collected in an air funnel from where the same fan pushed it through the plenum chamber under the bin and up through a perforated floor and the shelled corn. This bin was supplemented with electric heaters for the night time. When the moisture content of the corn reached 20%, the drying proceeded for 30 more days with the use of solar heat only (with the fan), down to 14% moisture content for 110 m3 of corn. This method makes use of the low temperature drying process. The electrical energy consumed in the test, which occured in 1973 (October 23 to November 17), was approximately 48 Kwh per cubic meter of shelled corn. During the tests the heat collected by the solar air heater on a sunny day was estimated to be equivalent to 175 Kwh of electricity (i.e. 50% saving on the overall process) During the drying period, outdoor temperatures averaged 5oc and relative humidity 71%.